For mainstream media I couldn’t go into as much detail as I would like so will dig a little deeper into the evidence here. 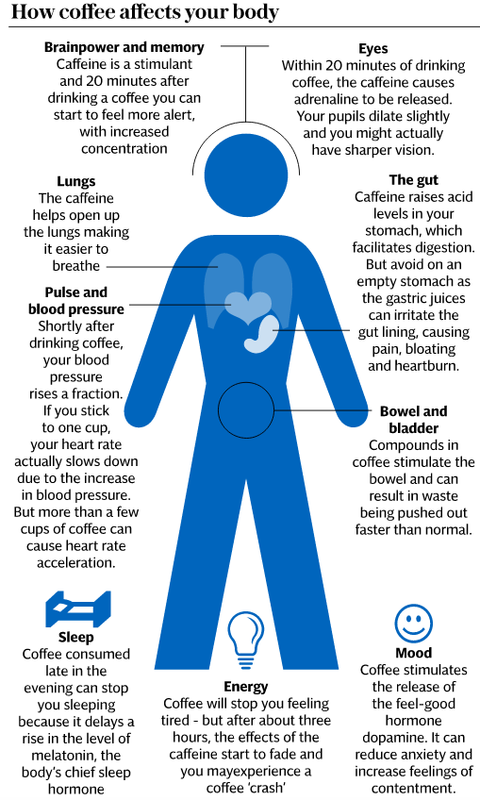 How quickly is coffee absorbed, and when does it pass out of you? A single cup of coffee has rapid absorption with caffeine uptake to the blood in just over 20 minutes and will stay in the blood stream for over 12 hours. The rate at which caffeine exits your body is dependant on your genetics. Blood pressure — Blood pressure rises a fraction after drinking, but these effects subside after an hour. This effect is more pronounced in those who are not used to drinking coffee regularly. Body — An hour after drinking your cup of coffee, the caffeine stimulates energy expenditure and increases your heat production, thermogenesis, that may help with weight reduction. Bladder & bowels — Drinking coffee will actually speed up your digestive system, particularly that of your large intestine within 5 minutes of drinking! Eyes — Within 20 minutes of drinking the caffeine in the coffee causes adrenaline to be released. As a result your pupils will dilate. Brain function — Recent study showed that coffee can enhance your memory 24 hours after consumption. This may not appear to be long, but most memories are lost within a few hours after learning. Caffeine is a stimulant and 20 minutes after drinking a coffee you can start to feel more alert with increased concentration and are less likely to make mistakes. Sleep — A recent study showed that caffeine has a great impact on our circadian timing, the body clock. Don’t let coffee interfere with your sleep, to be on the safe side do not drink any more after 2pm. This was a great piece of research that showed the effects of cells in culture and in people. You can also use this to your advantage. If travelling west, have a coffee and this will trick your brain and body to moving more in sync with the local time. Hippocampus — It is not purely benefits of caffeine on the brain a study from Pusan University showed that caffeine can impact the growth of new neurons in the hippocampus, the brain’s memory centre, and impaired long term learning. This study was in rats, and is very difficult to reproduce this type of of study in humans. Other risks — Generally associated with large amounts of coffee it can increase anxiety, insomnia, palpitations and increase risk of bone fractures and bone loss increases. Overall — Looking at long term studies in a large population set coffee consumption is generally beneficial. However a caveat to this is that to date their has not been enough randomised controlled trials to prove causation. As coffee contains many bioactive molecules not just caffeine, it is diffuclt to ascertain which are having the predominant effects. The Iowa Women’s Health study showed less death from diseases associated with chronic inflammation in 27000 women followed for 15 years! Also coffee consumption has been correlated with low risk of dementia and Alzheimer’s disease. Effects of caffeine on the human circadian clock in vivo and in vitro.